What is a fad French Bulldog color and why does it matter? 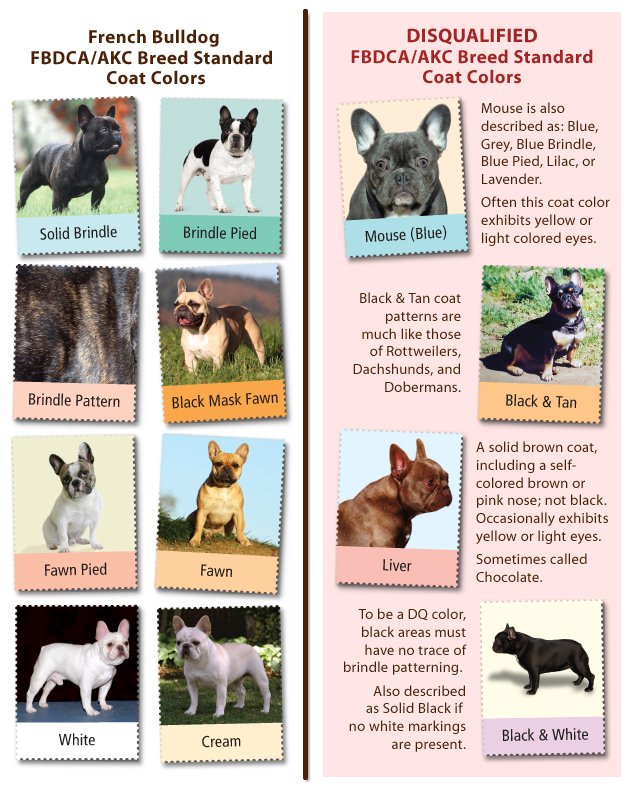 A fad color is a coat color disqualified by the ECFBC/CKC French Bulldog Breed Standard. These colors are also often referred to as rare colors. Those who intentionally breed disqualification (DQ) colors in French Bulldogs are motivated only to make money. Those irresponsible breeders who breed for and advertise rare colors are intentionally spreading unacceptable color genes through the gene pool and causing problems for reputable breeders whose main concern is to produce quality puppies that conform to our Standard. These irresponsible breeders producing fad colors are motivated by greed, since by calling their disqualified colors rare they are able to sell them for very inflated prices. The recent trend of breeding Merle French Bulldogs is particularly disturbing. The gene for Merle patterning is not found in purebred French Bulldogs. Breeders only produce them by cross breeding a French Bulldog to a dog of a breed that carries Merle – likely Chihuahuas. The resulting offspring are selected for the ones that look ‘most like’ purebreds, crossed together, and the puppies are then sold to the unsuspecting public as “purebred Merle French Bulldogs”. Worse than the scam being perpetrated on the public is the fact that Merles equal misery in far too many cases. Breeders eager to produce high priced exotic merles won’t hesitate to breed two merles together – a process referred to as “merle to merle breeding”. Crossing merle to merle has serious, well documented health risks – deafness, blindness, Microphthalmia (small, deformed or even missing eyes) and even a condition referred to as “lethal white” which can result in abnormally high deaths in utero. Ask yourself – what kind of person would risk this suffering in tiny French Bulldog puppies, just to get a higher price on the pups who do survive? What do you imagine happens to all of the abnormal, deaf, blind or disfigured puppies that are a by product of producing a handful of Merle French Bulldog puppies healthy enough to offered for sale? If a breeder is ignoring even the chances of producing blind, deaf or deformed French Bulldogs by breeding for Merle French Bulldogs, what are the chances they care at all about any other health testing? For every one healthy merle French Bulldog puppy you see, how many “Misery Merles” had to suffer, or even die? How high of a price are you willing to ask these puppies to pay, just so that you can own a fad color?